Wouldn't it be wonderful to celebrate the arrival of each Christmas season with a magnificent work of art inspired by the great Nativity collections found around the world? Now, you can with an enchanting tabletop Nativity Scene Tabletop Christmas Tree Collection that includes over 50 Nativity scene figurines and angel ornaments! Start your collection with Issue One, Holy Family and Nativity figurine 10-piece set. 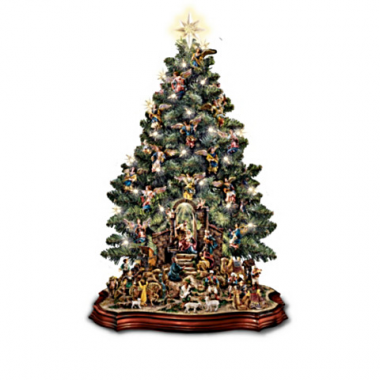 Soon, you can look forward to Issue Two, pre-lit Nativity Christmas tree and base that reflects the spirit of the season. 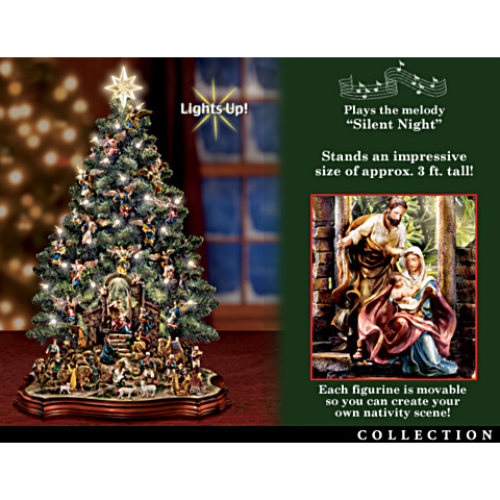 Later, your collection will continue with additional collectible 10-piece Nativity figurine and angel ornament sets, each set a separate issue to follow. Bask in the glory of Jesus' birth with the breathtaking scene depicted in this Nativity collection. An exclusive first from The Bradford Exchange, Hawthorne Village Division, this illuminated Christmas tree stands nearly 3 feet high and shines with 50 softly glowing lights and a lighted Christmas star. A unique Christmas home decoration or Christmas gift idea, this musical Christmas tree plays the cherished carol "Silent Night." Strong demand is expected. Order now!